Trawling through the iTunes podcast library, I stumbled upon an audio drama called We’re Alive – A Story of Survival, by Wayland Productions. It’s a zombie podcast, but before you run for the hills, hear me out. It starts off as you might expect, but it quickly becomes clear that they’re doing something a little different with the zombie post-apocalypse. For starters, it’s done in the style of a fully realised radio drama. It has an ensemble cast of voice actors and high-quality sound effects. There’s also a clever score and custom artwork for each chapter. There are 48 chapters overall, so plenty to keep podcast fans happy. Plus Wayland Productions are still active, with a new podcast Goldrush. Generally chapters are split into three or four parts, each part running from under ten minutes to around thirty minutes, which makes it easy to squeeze in on a lunch break, a car journey, a walk, or even just before bed. The sound effects are brilliant. Who would have thought that something that’s usually so visual—walking, rotting corpses—could be way scarier when only in audio. And these zombies aren’t the shambling, shuffling dunderheads you see in a lot of other venues. Think 28 Days Later undead who can sprint. Listening with headphones is absolutely the way to go—when you first hear the rapid thump-thump-thump of the monsters running at you, the sound growing louder and louder in your ears, it’s terrifying. Like I said above, they’re doing something different with the zombies. It was one of the main things that kept me intrigued all the way through. Apart from a couple of minor niggles (see below), the voice acting is fantastic and high quality. The score is also very good, building tension or relief at the right moments. I can only bring to mind one instance where I felt the background atmospheric music was out of place. Sometimes the dialogue can be hokey. There are a number of cliches that could have been avoided, and at one point a character even says (narrating) that she goes on “an emotional rollercoaster”. That old chestnut. But the podcast is otherwise quite slick and while it jarred for a moment, it didn’t put me off. Once in a while the line delivery is slightly awkward, and you can tell that the actors are reading from scripts. It’s never so bad that I wanted to stop listening, and generally they do an excellent job. It’s just the odd line. You can find We’re Alive on Tumblr, Twitter, YouTube and Facebook, too. Before anything else, I have to point to GrumpySkeletor on Twitter. This account is a parody and if you’re a child of the 70s or 80s, yes, it might tarnish your nostalgia but it’s so ridiculously fun. This is one of my first ports of call if I need a giggle. There is also an article at The Poke listing 34 Times Grumpy Skeletor was the Funniest Twitter Account in the World. On a music theme, for a good few months now I’ve been unashamedly stalking the music compositions of German composer Michael Maas. I’m a huge fan of epic score style music (it’s a great writing backdrop) and a lot of his compositions could easily be from movies, ads, or nature documentaries – they are so slick and beautiful. Here are a few links, though there is a lot more available on YouTube and you can grab copies of his work on iTunes. Some of you amazing creatives might find his music inspirational like I do. ♫ Kaeri. This is soft and slow, with a slight melancholy edge to it which I love. Great to write to! Just listen to the violin and cello. ♫ Skylight (Thunder & Rain Edition). Epic and pretty. ♫ Monster Divinity (Position Music). This is a bit different, more gritty. Sounds like it could be from a first-person horror or sci-fi game. ♫ Morpheus and the Dream feat. Felicia Farerre. The beginning of this one is gorgeous, with a lovely build and stellar vocals. I really hope this composer continues to do higher profile work and gets more recognition. And just in case you need a bigger dose, try this: Two Hours of Epic Emotional, Vocal and Piano Music by Michael Maas. Researching your favourite places and writing what you know is one of the best parts of the writing process. I’m currently re-visiting a trip I took to India over a decade ago because some of the locations will feature in a story. I went to southern India for three months back in the year 2000 as part of a conservation programme. Honestly, I wanted to see a wild tiger, but I also wanted to do something completely different and it marked my first ever trip outside the UK. I mostly lived in a small city called Puliangudi with a family who were volunteers on the programme. They made me and the other British girls feel like part of the family, and when I had photos taken towards the end of my stay, mummy lent me her wedding jewellery to wear. She also asked some of the girls from the local school to dress me in a lilac crepe sari and weave fresh jasmine flowers into my hair (because I would have made a complete hash of it if left to my own devices). Alas, I didn’t get to see my wild tiger, though I did see a couple in captivity, as crocodiles, countless monkeys and birds, elephants and boars. Oh, and during a weekend excursion, a small island inhabited by lions whose roars drifted eerily across the lake to my hotel balcony at sunset. One of the coolest things about staying in Puliangudi, apart from the amazing hospitality, was that I was close to the Ghat Mountains which run along the western edge of the Deccan Plateau—a 62,000 square mile deciduous rainforest. My most memorable place in the Ghats is Periyar National Park, where I could have happily stayed forever. I vividly remember taking the boat ride across Periyar Lake, barely blinking in case I missed the flick of an orange and black striped tail. Here is a video highlighting some of the area’s wildlife and flora. Anyway, what I’m basically saying is that this is my favourite type of research because it takes me right back to that time. Sometimes I can almost smell the towns in the air, a mix of dust and cooking spices and heat and open sewers; there are so many great memories attached. I love that I can take my characters there and relive it. I’m linking to the main theme to a Tamil political thriller movie I went to see while in Chennai (Madras). The movie was Mudhalvan and it was epic. ♫ Kurukku Chiruththavale, composed by A.R. Rahman. I am reblogging this from an old journal. 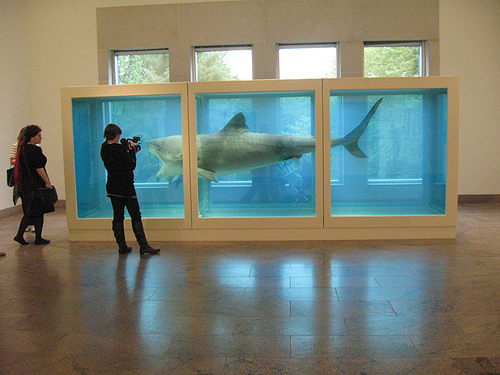 In 2012 I visited the Tate Modern while in London and saw the Damian Hirst exhibition. I’ve never been the biggest fan of (a lot of) modern art, so I was dubious going in, but open to try it and hopeful that I’d come away with a newfound appreciation. Well, I did. Mostly. The exhibition was interesting and beautiful and grotesque and frustrating all at the same time. Not all of the pieces worked for me, but a couple of them worked strongly enough that I came away with a general good feeling. I’m still not sure if modern art is my thing, though I’m much more amenable to giving it a whirl. Pieces that were hits: the shark, the butterfly room and Black Sun. Pieces that did not hit: The medicine cabinets lost their charm after the third or fourth. I get that our bodies ultimately fail us, and they may have provided a thematic thread through the whole exhibition. But! I didn’t need three roomfuls of this. And I admit, as much as I loved the concept of the butterfly room, I could only stick it for about three minutes before I had to duck out (literally). A lot of them were tropical butterflies and they were bloody humungous! One landed on my head as I went in and gave me the wiggins. He’s very focused on birth/health and death/decay. You go from the butterfly room, with its canvas-lined walls embedded with pupae that the butterflies hatch from and carry out their life cycle, to the black sun room which is a gigantic mural made of dead flies caught in resin. Yum. Another piece of note—one I’m still not sure whether I liked or not—is A Thousand Years. 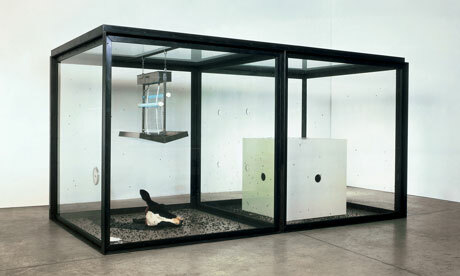 A massive glass box houses a smaller white box filled with hidden maggots. These maggots are continuously hatching into flies, which fly out of the white box and feed on a severed cow’s head. There’s also an electric insect-o-cuter in the box which draws many of the flies and obliterates them. Others just die naturally—they litter the floor like a black carpet. I must say, I felt a bit squiggly looking at that one. Plus, you could smell this faint undercurrent of flies and rotting cow’s head. Conceptually, it’s a well-executed piece.